To commemorate the 50th anniversary of Harper Lee’s beloved classic To Kill a Mockingbird, filmmaker Mary Murphy has interviewed prominent figures—including Oprah, Anna Quindlen, and Tom Brokaw—on how the book has impacted their lives. These interviews are compiled in Scout, Atticus, and Boo, the perfect companion to one of the most important American books of the 20th Century. Scout, Atticus, and Boo will also feature a foreword from acclaimed writer Wally Lamb. Mary McDonagh Murphy is an Emmy Award-winning producer and an independent documentary director whose work has appeared on NBC, PBS, and CBS. 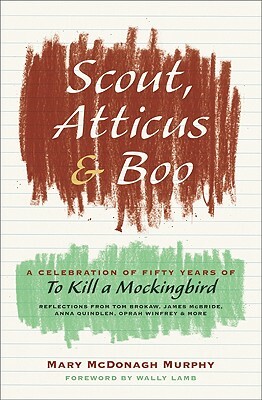 This book is based on her interviews in the film Harper Lee: From Mockingbird to Watchman, broadcast on PBS's American Masters in July 2015. Murphy has written for Newsweek, the Chicago Tribune, Daily Beast, and Publishers Weekly. She lives in Scarborough, New York, with Bob, Kate, and James Minzesheimer.